I'm currently working with AdSense and learning different tips. And you know, when I learn something I share my knowledge with you. I am willing to share AdSense tips with you. Today I will share the best performing Ad Types and Sizes for AdSense publishers. Those who are currently working with AdSense should know, it has different types of Ad Types and Sizes available for the publishers. 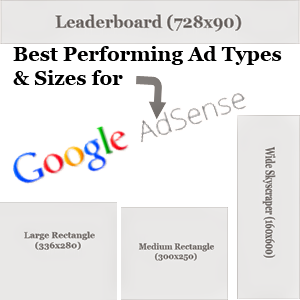 Depending on users' demands AdSense provides these ad types and sizes. But all of them are not effective for always. 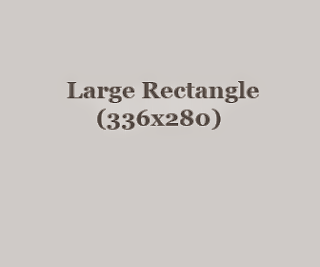 Large Rectangle: The size of a large rectangle is 336x280. Looks better when you place this within a post or after the post. Sometimes placed at the right sidebar. But placing it within contents is more effective. Ideal for Text/Image ads or Rich media. 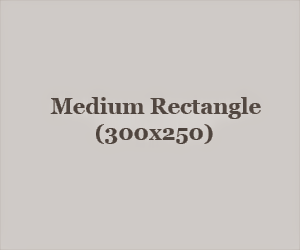 Medium Rectangle: Almost similar to large rectangle. But little bit smaller in size: 300x250. Used when the publisher wanna save the site space. Or when you don't have sufficient room to place large rectangle within contents or side bar. Ideal for Text/Image Ads. But can be used with rich media too. Leaderboard: Usually placed at the top of the site. These ads are attractive when used with rich media or flash ads. The size of this ads is 728x90. But when your site has a side bar on the left or right, then it can only be placed at the top. Just below the site title. I mean huge space is required to place a leaderboard ad. Wide Skyscraper: The most successful ad size I believe personally. Usually placed at the side bar of a site. And I think without a left or right sidebar, you can't use wide skyscraper. Skyscraper is ideal for Image/Rich Media/Flash ads. Though AdSense sometimes shows text ads here. But when rich media ads are shown on skyscraper, the chance of attracting the visitors increase significantly. The size of wide skyscraper is 160x600. So you must have at least 200 px side bar. It can be left or right. But I think right sidebar is more effective. There is a large skyscraper too. Which is 300x600. But I think this will be really space consuming. And if rich media ads are shown on large skyscraper, definitely it will slow down your site which could be dangerous for you. So I suggest you to use this ad with rich media, at the right sidebar of your site. It's true that these 4 ad sizes perform well. But if your site doesn't match with these sizes, don't worry. Choose the ad size that complements your pages most. Read the guide to ad sizes. These two ads has more CTR. And they can hardly slow down your site. AdSense recommends to use all of these types of ads. So you have to allow all of them to be appeared on your site. Because sometimes rich media ads are not available to be displayed. Though the text ads will pay you low but sometimes your ad space might be blank if your disallow them. To maximize your earning, you've to show all these three types of ads on your site. The Simplest Way to Download Audio/ Video from YouTube! One of the most popular sites as well as the # 1 video sharing site of the world, YouTube, has no download option. That's why thousands of third party software, browser extensions/ add-ons and many other websites are providing YouTube Downloading Service. Today I'm gonna share a site that provides free YouTube Video Download Service. This site is very simple and easy to use. And it will never cheat you by redirecting you to boring ads. The operation of the site is very simple. First you need to collect your desired YouTube Video URL. I mean to download a video, first you have to visit YouTube. Then you will search for your desired video. Here I've entered my desired URL in the download box. And I've collected it from YouTube. Then I've just copied and pasted it here. In my example, I got various download formats, ie. mp3, mp4, flv, 3gp etc. Hit on the download button which you wanna download. If you are a regular user of Microsoft Excel then you might be in danger while typing more than 15 digits in a cell. If you type 1111222233334444 then it will be 1111222233334440. Or if you type 25127680876675435 then it will be 25127680876675400. Simply the digits after 15th place will be changed to zeros! Doesn't it seem peculiar? Today I will explain when & why this problem occurs and how you can solve it easily. But when you press Enter, the output will be 1234324545679870. Excel changes the last digit to a 0. And why someone needs to type more than 15 digits in a cell? It can't be a currency figure. Usually when you type a Credit Card/ Debit Card/ BO Account Number you have to type 16 digits. And the calculation of excel doesn't allow you to type more than 15 digits. That's why it converts the last digits (after 15th place) into zeros. I don't know what does it mean! 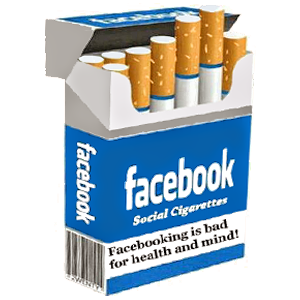 :) Anyway, I can show you several ways to get rid of this problem . . . I don't know why the inverted mark disappears automatically. But I can explain why the 16th digit doesn't change to 0. Because when you type ' before a number then Excel doesn't consider this value as Number. It maybe consider the cell as text. That's why it remains unchanged. Maybe the 2nd method is more useful. Before typing more than 16 digits in a cell, you have to format those cells as text. Format cell window is same in all version of MS Excel. After selecting the cells, you will just need to choose the Text option and then hit OK. That's it. Now you will be able to type more than thousand characters in a single cell! All versions of Microsoft Excel. I tried a lot but couldn't create an attractive image for this post. L But I can assure you this image has meaning. Or I can explain the image properly. J And I'm little bit confused about how to start this post. Because this is somewhat unusual topic. Anyway, first I will try to give you a brief idea on filename extensions and then I will try to show you how can you play with these. Let's start . . .
A filename extension is the identity of the file type. It tells you what the file is, What can you do with it and what you can't. Similarly, your operating system also use the filename extension to execute that file. A wrong filename extension could misdirect your system to treat that file properly. Folder options can also be found from the view menu of Windows Explorer (My Computer). You can enable it from anywhere as you like. Hope you're ready for today's special. I'd like to request you to have a look at the above image. 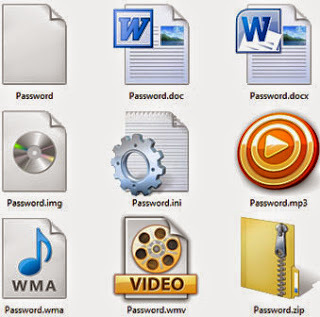 There are 9 types of files in the image. But their name is same - Password. Actually all of them are same. And basically it is a document file which contains all of my passwords! As it is a document file you can only open it when its extension is .doc or .docx. Otherwise you can never use this file. Asmt.img: It will show your file as burnable image file. But none of the above file types will let others to use your file. Because only you know that this is a doc file. The file can only be used when you change the extension to .doc. Because Windows can't usually work with wrong file name extensions. And what happens if a file has no extension? This is more interesting. Nobody will be able to guess how to use it. Look at the image again. The first one has no extension. If I change the word Password, nobody will be able to guess what the file type could be! Never think that you can only hide files by changing extensions. There are many other things to play with filename extension. Anytime you can puzzle anybody with this tips. Suppose your friend has a favorite movie named Titanic.mkv or Titanic.mp4 or Titanic.flv. If you change the name to Titanic.mp3 or Titanic.wma then he can only hear sound. And it will be opened by default audio player. He will not be able to see the video. And if you rename it by any other extension like .bat, .exe or .ini then neither audio nor video will be played! Sometimes you can change the file extension without any problem. Suppose if you change .jpg extension to .png then nothing will happen. Because both of them are image file. Similarly, when you change .flv by .mp4 a video can be played without any problem. At the very beginning I said, I don't know how to start this topic. But now I've to say, I don't know how to end! Don't know how much you get from this post. But I can assure you, just spend a single week on filename extension. Play with it. You will be the master . . . ! Today I've come with an interesting and funny post for you. Maybe you've already realized what the topic is. Because the post title defines the post clearly! Android OS is now very popular for mobile devices. Even with some limitations, exciting features of Android devices are now minimizing the Market Share of Apple and Samsung. On the other hand, Nokia is out of competition for last few years. But the Lumia Series are now getting popularity among the mobile users. Before moving to the topic I'd like to share something with you. You know I've moved from Dhaka to Khulna with my new job. Now I am in Eid Vacation. I hardly used mobile earlier. But as I am now in Khulna, I need to contact home frequently. So I purchased an Android Phone. Normally I don't write about mobile devices. Only few posts have been published so far. But from now and then you may get more tips on Mobile Devices! Okay let's back to the track. I'm gonna show a magical tips today- Convert Android into Windows! Get ready for that . 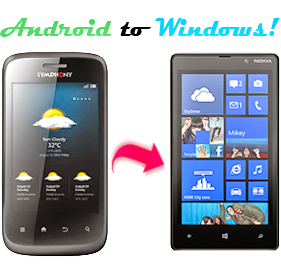 . .
Hit on the above Download Link and download the file named Android to Windows. After downloading the file you need to unzip it. Now go to your device file explorer. Locate the file where you've kept it. Hit the file named Launcher8_1.2.6.2-1.apk. Hit on the install button and wait few seconds. Now hit on the open button and see magic. Go to the Settings > Applications > Check the option named Unknown Sources (Allow installation of non-Market applications) > That's it. This is nothing but a theme of Windows 8. After installing this theme on your Android Device, your phone will look like Nokia Lumia or Windows Phone. You will be able to see live tiles. But all other tasks will be operated by Android System. This theme pack works with both Mobile and Tablet. When you click on the home button of your device, it will ask you whether to complete action using Launcher 8 or Android. Don't be afraid. It's simply a look of Windows 8. All your settings, system will remain unchanged. And if you face any problem or if you don't wanna use it no problem. You can easily uninstall it from your device. Settings > Applications > Manage Applications > Hit on the Launcher 8 > Hit on the Uninstall button.